Figure 1. Map showing overall cruise track for the Musicians Seamounts Telepresence Mapping expedition. Yellow lines indicate planned mapping survey lines. Publicly available bathymetry in the background downloaded from NOAA's National Centers for Environmental Information archives and collected on various survey platforms. Image courtesy of the NOAA Office of Ocean Exploration and Research. Download larger version (jpg, 4.2 MB). Operations during the Musicians Seamounts Telepresence Mapping expedition will include focused mapping and strategic mapping transits by NOAA Ship Okeanos Explorer within the waters of Hawaii and in international waters at the Musician Seamounts chain, up to ~650 nautical miles north of O'ahu, Hawaii. The expedition will commence on August 8 in Honolulu and conclude on August 31, 2017, in Honolulu. While underway, the team will conduct round-the-clock operation of the ship’s deepwater mapping systems (Kongsberg EM302 multibeam sonar, EK60 split-beam fisheries sonars, and Knudsen 3260 chirp sub-bottom profiler sonar). The ship’s high-bandwidth satellite connection will be used for hourly raw sonar data transfer from ship to shore, real-time ship to shore communications, real-time sonar control from shore, and real-time video streaming of sonar screens and the ship's cameras. 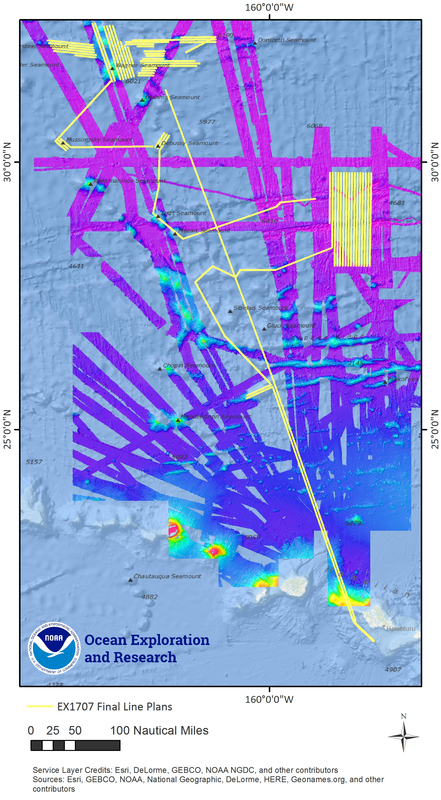 Mapping plans include obtaining mapping coverage over at least 20 seamounts and ridges within the Musicians Seamount chain and 3,600 square nautical miles of the Murray Fracture Zone. The interaction of mantle plumes with nearby mid-ocean ridges is considered still poorly understood after several decades of research. Two sets of ridges in the large northern mapping area of the Musicians Seamounts (Figure 2) are seen to extend from the Musicians to the East. Poor mapping data make these ridges difficult to characterize, however. For example, are they actually ridges or sets of distinct, aligned seamounts? Being able to analyze the seamount structure and shape can inform the type of formation environment of these seamounts. Figure 2. 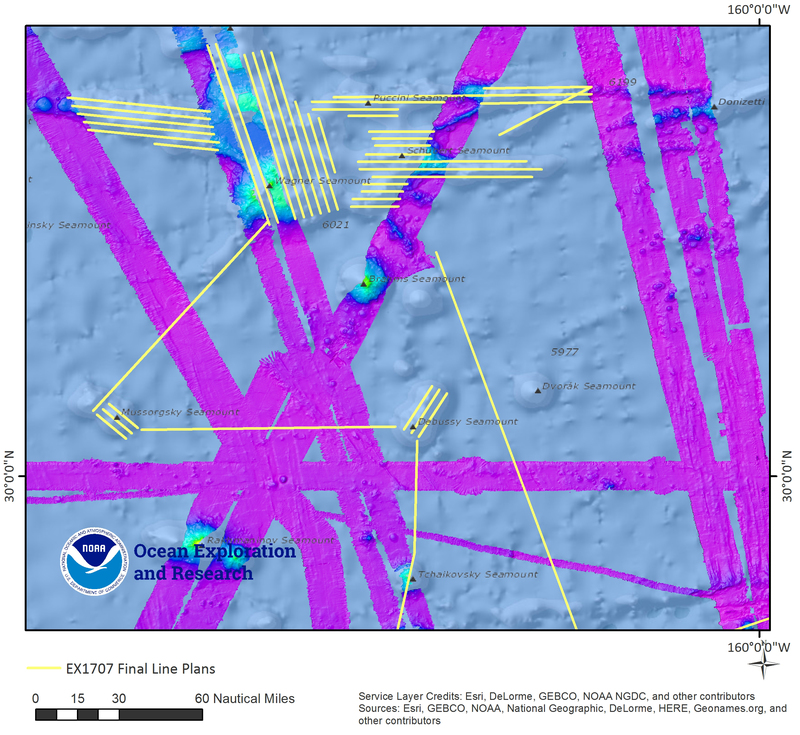 Mapping showing planned mapping survey lines over several seamounts and ridges in the Musicians Seamount chain. Publicly available bathymetry in the background downloaded from NOAA's National Centers for Environmental Information archives and collected on various survey platforms. Image courtesy of the NOAA Office of Ocean Exploration and Research. Download larger version (jpg, 3.6 MB). Figure 3. 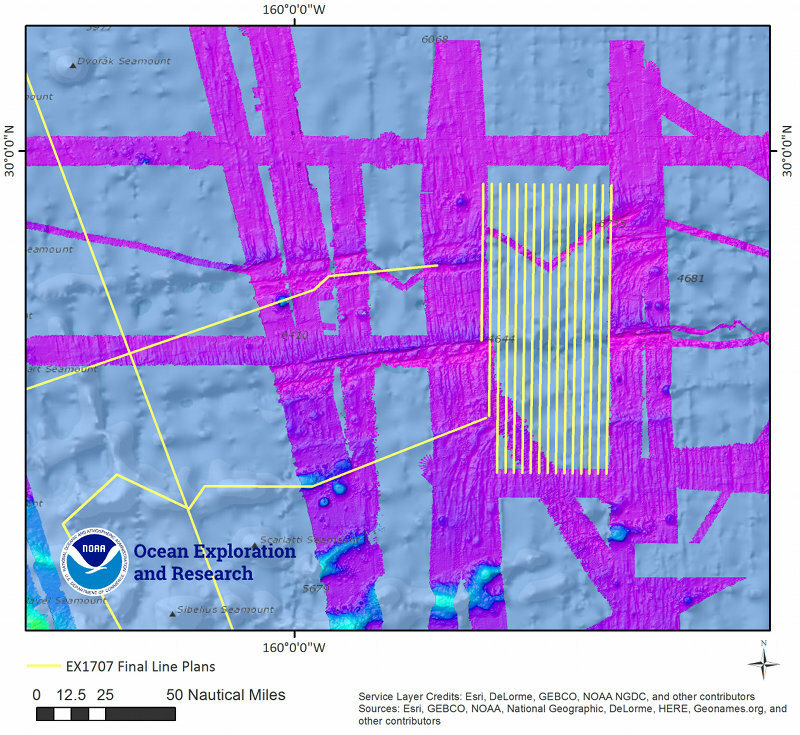 Map showing planned mapping survey lines at one section of the Murray Fracture Zone. Publicly available bathymetry in background downloaded from NOAA NCEI archives collected on various survey platforms. Image courtesy of the NOAA Office of Ocean Exploration and Research. Download larger version (jpg, 3.9 MB). Across the Pacific, there are several very large, multi-segment fracture zones (FZs) that indicate the former existence of oceanic transform faults that existed for millions of years. These FZs underwent dramatic changes in segmentation, as revealed by their disjointed structure. Mapping data provides a wealth of information about the structure of these transform faults, when they formed, and the subsequent evolution of their FZs, possibly including information about whether the FZs were weakly or strongly coupled. Weakly coupled FZs can indicate extensive serpentinization, which can alter the production and composition of magma at subduction zones. The new mapping data will allow a careful analysis of the FZ evolution within the Musicians Seamount chain. The application of telepresence to mapping cruises allows for a distributed team of experts and trainees. The Expedition Coordinator (Elizabeth 'Meme' Lobecker) for the cruise will be based on shore at the Exploration Command Center (ECC) at the University of New Hampshire Center for Coastal and Ocean Mapping/Joint Hydrographic Center (UNH CCOM/JHC), with regular and ongoing communications with the ship and onboard mapping lead (Amanda Bittinger). Skilled mapping experts Charles Wilkins and Daniel Freitas will be onboard as watch leaders and Explorers-in-Training Elizabeth 'Claudia' Thompson and Brandon O'Brien, who participated in the Telepresence Mapping in American Samoa and the Cook Islands expedition as shore based Explorers-in-Training (EiTs), will be onboard as watchstanders completing the offshore portion of their training as part of ongoing efforts by the NOAA Office of Ocean Exploration and Research (OER) to train the nation's next generation of ocean explorers. EiT's Kelsey Lane, Laura Almodovar-Acevedo, and Victoria Dickey will be onshore with Meme Lobecker during this expedition and will sail on an Okeanos cruise in 2018. Telepresence uses modern computer networks and a high-bandwidth satellite connection to enable remote users to participate virtually in ocean research and exploration cruises. OER has been leveraging telepresence capabilities since the early 2000s. Through telepresence, remote users provide support for operations planning and execution, troubleshoot hardware and software, and provide data interpretation during exploratory ocean mapping and remotely operated vehicle missions led by OER. the broadening of multidisciplinary applications of ocean mapping cruises, including outreach, education, and communications efforts focused on expanding societal cognition and benefits of ocean exploration.